Hey friends! It’s been a while since I published a post. My absence is all down to having a rough third trimester of my pregnancy and also welcoming our baby in early June. I was able to do some knitting and crocheting though, and even packed one of my knitting projects (a sweater) in my hospital bag. It was great to knit a few rounds while I was stuck in bed recovering after having my little girl. I’m now five weeks postpartum and gradually finishing off/starting new projects in between looking after baby and recovering. I recently finished one of the projects I’ve been working on – the discipline sweater (pattern by Bromefield). This was my second attempt at knitting the sweater, as my first attempt did not go well due to the yarn I used…I just wasn’t feeling the yarn for the project. This time round, I switched to a different yarn – Paintbox Yarns Simply Aran and boy was I glad I did. This yarn is a lovely, soft and squishy acrylic yarn, you would almost not believe it’s acrylic. 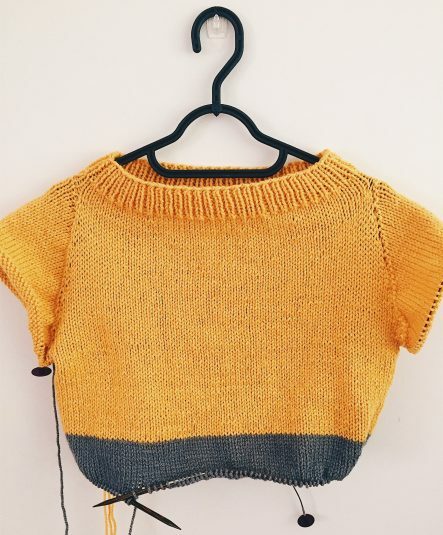 Almost halfway through knitting the body, I decided to make the sweater a two-toned sweater. This was such a great idea as the colours really complimented each other. As I neared completion of the sweater, I started thinking about blocking. 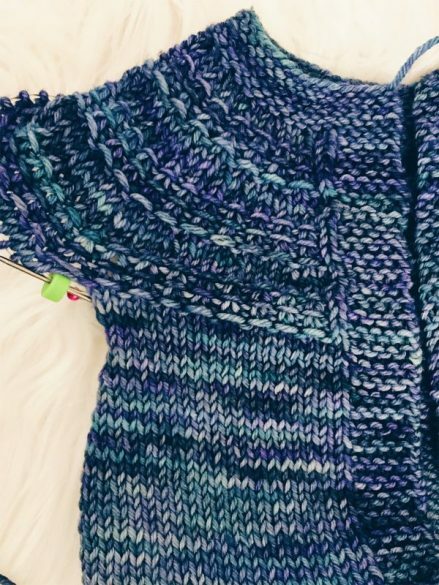 I’ve always felt that blocking acrylic yarn can be tricky and I’ve never blocked any project that I have made with acrylic yarn due to this reason. I’ve read many articles that tell you acrylic yarn can and should be blocked but I have never been convinced that the methods they suggest really work. I checked a few knitting and crocheting forums and came across one where someone advised machine washing and tumble drying the item following the care instructions for the yarn. So, I decided to take the plunge…BIG MISTAKE! The sweater came out nearly four to five sizes bigger, from a 38″ bust to a 48″ bust, no joke! I very nearly cried as I was looking forward to rocking the sweater during winter…it really hurt. I tried searching online to see if I could find a way to shrink it but found nothing. So, sadly, I won’t be able to wear this sweater but I’ll give it to someone who can. To be fair, apart from the size increase, the sweater blocked really well. Needless to say, I will not be blocking acrylic anytime soon..ha! Have you successfully blocked acrylic yarn? If yes, please share how in the comments section below. 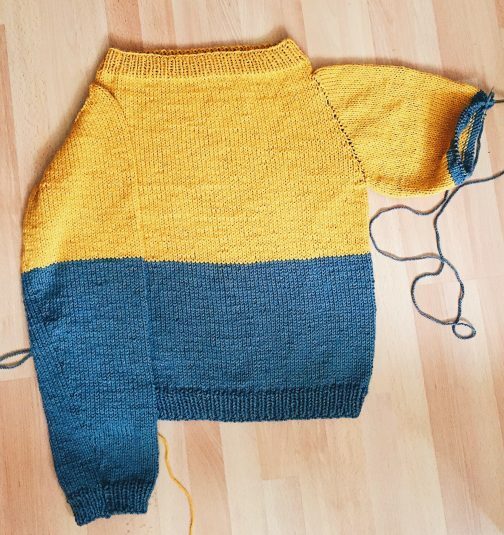 The good news is that I have decided to make the sweater again (yaay!) but this time with merino wool – Malabrigo Worsted in Polar Morn. I’m pretty excited to cast this on once I finish my current WIP, I think it’ll be a beaut. For once, I am working on just one project and plan to finish it before moving to another. I don’t expect this phase to last though as I enjoy working on a few projects at the same time. 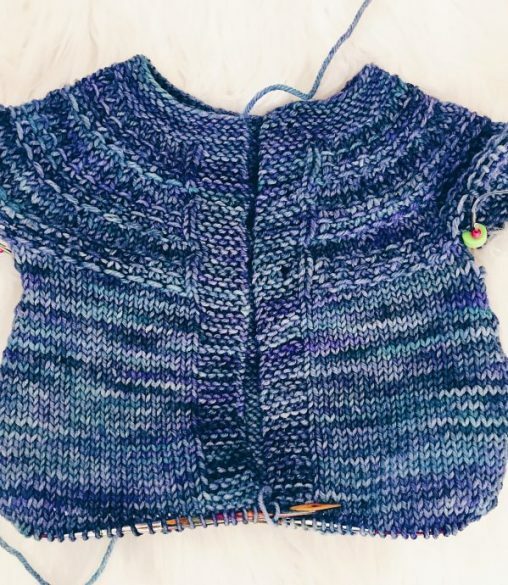 My current WIP is a cardigan that my baby can wear during winter. The pattern is the Hyphen Cardigan by Frogginette and I am using Malabrigo Rios in Azules. I’m knitting the 6 months size and I’m pretty much done with the body, so it’s on to the sleeves soon. The pattern is very straight forward and easy to work through and I really love the detail at the top of the cardigan. Pretty excited about finishing it off and dressing my little girl in it during the winter. I do have other WIPs that I’ve sort of parked until the hyphen cardigan is complete and I’ll do a separate post about them. Let’s not talk about those WIPs that have somehow been forgotten and are in a boxed up pile…shhh!